Sleep is something that really makes a noticeable difference to my skin but it's something that most people don't get enough of. If I have a few late nights or restless nights/broken sleep etc, it always shows in my skin so if a product claims to mimic the effect of a good night's sleep, I need it in my life! 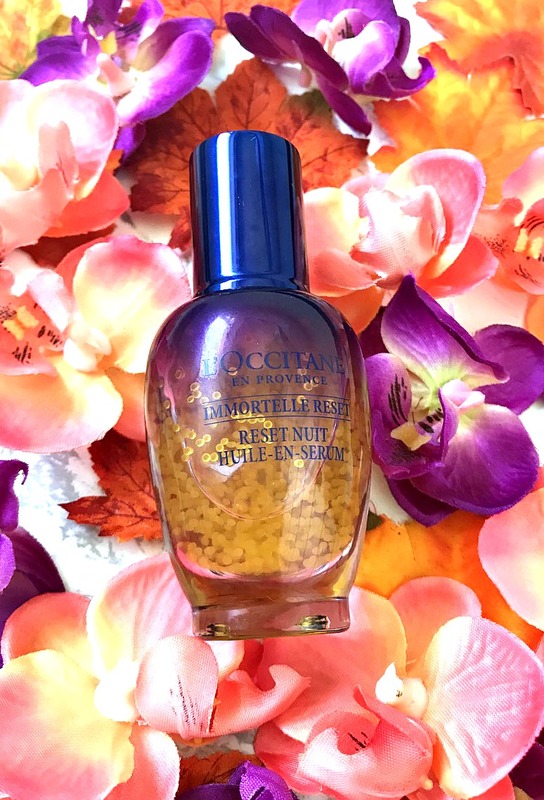 When I heard about L'Occitane Overnight Reset Serum, I was instantly intrigued. Last year, I reviewed the L'Occitane Immortelle Divine Cleansing Balm so I was already familiar with the Immortelle Essential Oil (one of the key ingredients), which has twice the anti-oxidant power of Vitamin E. The other two key ingredients are Marjoram Extract (it has the ability to restart and reawaken gene expression function) and Acmella Oleracea Extract (also known as nature's alternative to botox). The serum has a light gel texture but within it are small bubbles of the Immortelle Essential Oil that break down when massaged into the skin. It can feel a little tacky on the skin initially but when massaged in, the skin feels soft and smooth. I apply this at night after cleansing and before my other serum and moisturiser/oil/night treatment of choice. L'Occitane claim that after 1 night, 97% of users say that their skin looks well rested. After 7 nights, 90% of users noticed that fine lines are less visible and after 28 nights, 100% agree that skin texture looks transformed. I can safely say that I can agree with these statistics. I loved it so much within the first week of use that I brought it on holiday - it was the only full sized product that I brought as I tend to use mini products and samples when I go away but I knew that this couldn't be left behind. While I love going on holiday, I am usually so eager to get back to my full skincare cabinet as long days in the sun (well protected with spf) usually means my skin is dehydrated, possibly dull and just not looking its best but that wasn't the case this time because of this L'Occitane Overnight Reset Serum. I have used this every night without fail and my skin is looking good - it's plump, smooth, firm and glowing. I fainted last week and have had disturbed sleep for a few nights since then because I'm in a bit of pain from how I collapsed and despite that, my skin is not showing any of the telltale signs that usually accompany a lack of sleep - in my case, blemishes, dullness and dark circles. I love how even my skin looks and because it's glowing, I find that I am wearing very light bases because I don't need or want to mask anything. I will continue using it throughout Autumn and Winter when I usually have to work harder to get my naturally dull skin, to glow and I will keep you updated but, so far, it's love! I also have to mention the stunning bottle - I love the purple/midnight blue ombré effect and the yellow that you see is from the little bubbles of Immortelle Essential Oil. It's a glass bottle, which is quite weighty but I didn't care about the weight in my travel bag as the results are so good! Like I said in a previous post, I always think that it's worth investing in a serum even if the rest of your routine is more budget-friendly as a good serum will always deliver results. L'Occitane Overnight Reset Serum is priced at £49 or €54 for 30ml. All products are bought by me, unless otherwise stated. This was kindly sent to me. Opinion is always my own. Affiliate links may be used.